The Guardians: Hero and Superhero is a perfect demonstration of accuracy and innovation in stone drafting. This 13 foot-high statues is the result of a work put together by Union Marble & Granite and Precision Stone and Italian architect and designer Antonio Pio Saracino. Both the statues are installed outside of Bryant Park in New York City. The Hero statue, weighing 6,000 pounds is made from Olympic white Vermont Danby marble. It was created as an interpretation of Michelangelo's David. Union Marble fabricated the statue, with Precision Stone providing the drafting, project development, coordination and installation. Picco Engineering of Canada, assisted with the assembly and installation procedures alongwith lifting devices and calculating centre of gravity for each of five preassembled pieces. The sculptures soar upward through a system of repeated plains of marble (Hero) and polished stainless steel plates (Superhero) to address the surrounding skyscraper architecture. 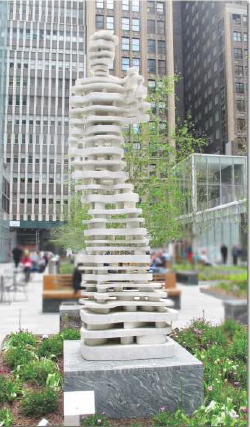 In December 2013 the sculptures were unveiled in Manhattan at a gala celebration. There they stand as an emblem of collaboration between US and Italy.